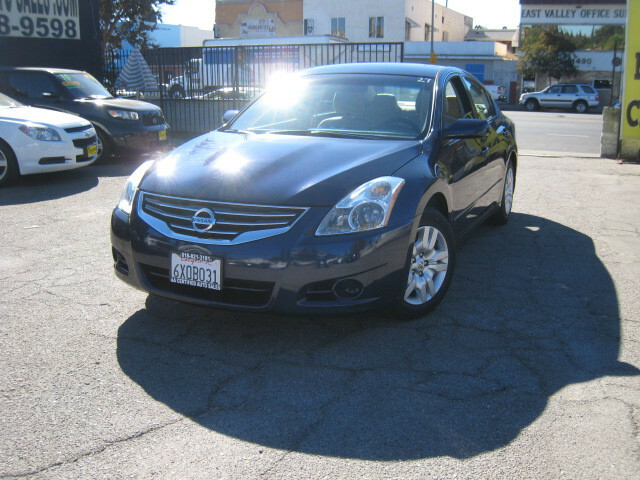 2012 NISSAN ALTIMA 2.5S.........ONLY 87K MILES !!!!!!........ THIS ONE OWNER ALTIMA IS EXTRA CLEAN, WELL KEPT AND SERVICED AT LOCAL NISSAN DEALERSHIP. THE ALTIMA HAS A WELL BALANCED 4 CYLINDER ENGINE THAT HAS PLENTY OF POWER AND GETS OVER 30MPG ON THE FREE WAY , CABIN IS VERY ROOMY, HAS COMFORTABLE AND QUITE RIDE. LOADED WITH AUTOMATIC TRANSMISSION , AM FM MP3 CD PLAYER WITH AUX , AIR CONDITIONING , POWER DOOR LOCKS , POWER STEERING , POWER WINDOWS , POWER MIRRORS , TILT WHEEL , CRUISE CONTROL , SIDE AIR BAGS , FRONT AND REAR HEAD CURTAIN AIRBAGS , DUEL FRONT AIR BAGS................!!!!!!!!!!!!!!!!!!!!!! GREAT CAR AT A GREAT PRICE...............!!!!!!!!!!!!! WE OFFER FINANCING FOR ALL TYPES OF CREDIT SITUATIONS AS WELL AS LOW APR CREDIT UNION FINANCING, WE TAKE CASH, BANK CHECK AND CREDIT CARDS FOR PAYMENT. OPEN 9:00AM-6:00PM DAILY AND 10:00AM-5:00PM SATURDAY .............!!!!!!!!!!!!!!!!!!! CALL (818) 378-9598 ANYTIME TO SET AN APPOINTMENT FOR A TEST DRIVE.............!!!!!!!!!!!!!! SPECIAL FINANCING FOR UBER AND LIFT DRIVERS AVAILABLE !!!!!!!!!!!! CALL FOR DETAILS !!!!!!!!!! !